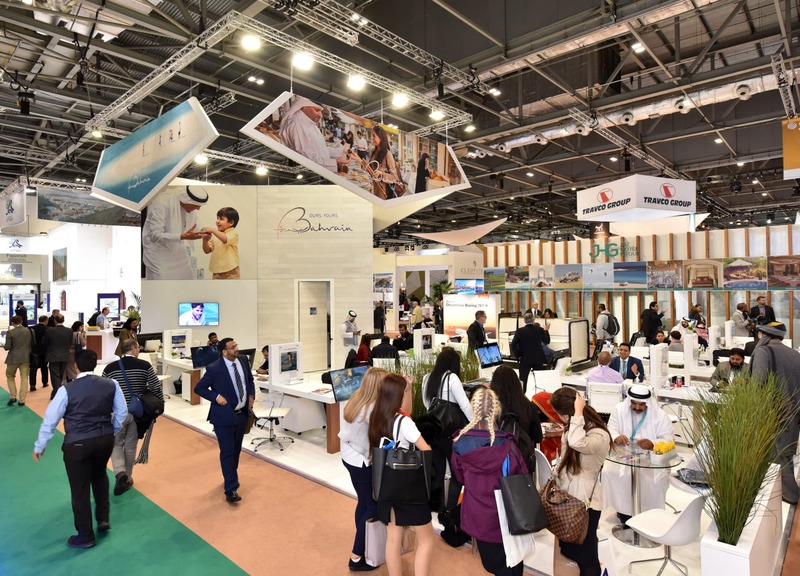 The Bahrain Tourism & Exhibition Association (BTEA) acts on behalf of the government of Bahrain to promote tourism & attract new visitors to this exciting middle eastern country. 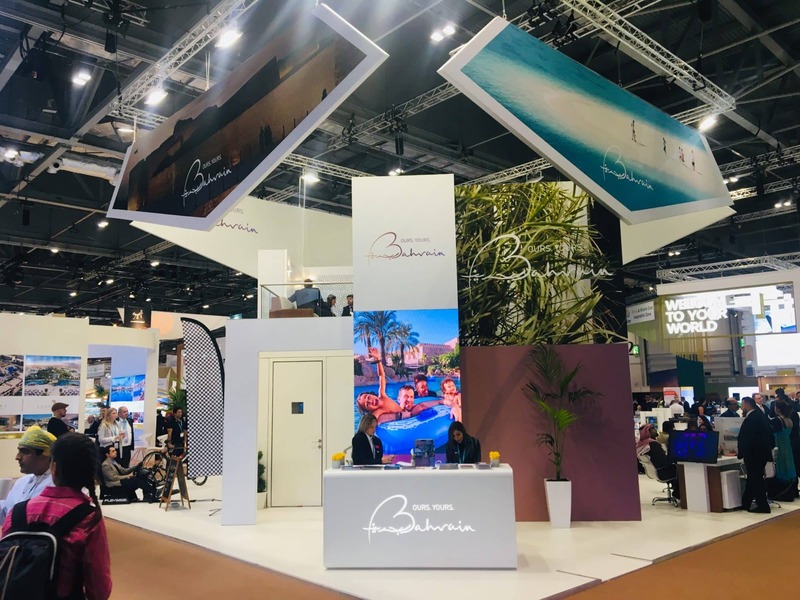 We were approached by its event agency, Orange Media, & asked to produce a beautiful bespoke two storey stand for BTEA at the World Travel Market 2018 in ExCel London. Although spacious (217.5m²) the design had to include a lot of special features. 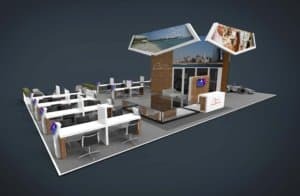 From comfortable seating for 16 co-exhibitors to an entertainment/demonstration area to be used for everything from handicrafts to musical performances. Gulf Air also required its own meet & greet area to display a first class cabin simulator. While the upper-deck had to be transformed in to an exclusive Bahraini VIP lounge with luxury fabric, furnishing & fretwork. 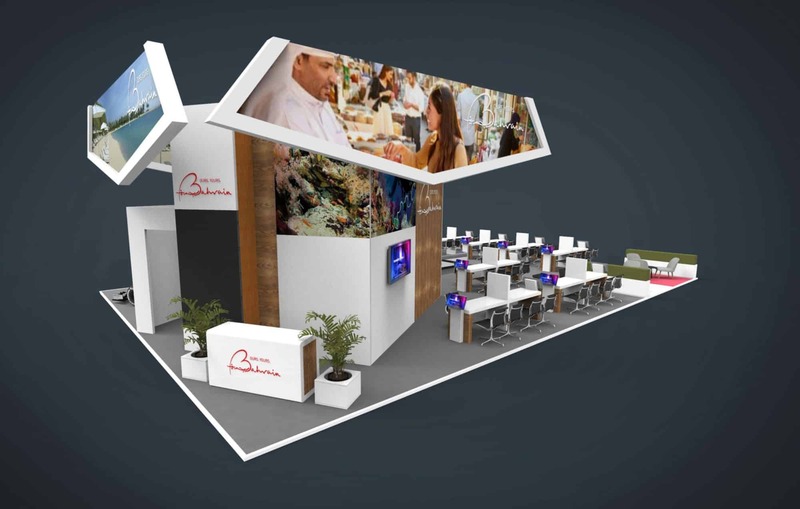 Symbiosis recreated Orange Media’s existing design, producing comprehensive 3D proofs & detailed structural calculations to meet the space requirements & the strict venue Health & Safety regulations. Beautiful custom made furniture was created by our craftsmen. Arabic style Majlis sofas were handmade in wood with soft gold upholstery. Matt white welcome counters were inset with wood panels & had intricate logos laser-cut & back-lit. Co-exhibitor desks included dividing screens with stand-off acrylic logos as well as individual LED screens. Installation very smoothly with the three-part banner, metal framework & white laminate floor in-place by the end of the first build day. 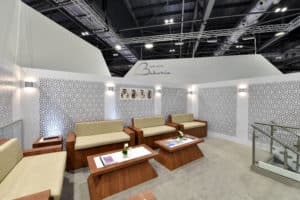 The structure was then wrapped inside & out with stunning seamless fabric graphics & inset with large LEDskin panel video walls. 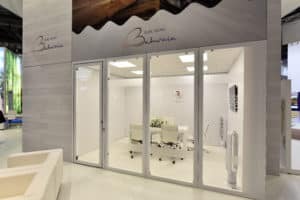 A private meeting room, created underneath the mezzanine, was kept light & bright with white walls & clear acrylic panels. A concealed cloakroom with lockers kept the stand tidy & personal items safe. While a separate kitchen area ensured co-exhibitors & guests were refreshed with drinks & snacks throughout the show. The completed stand was handed over to a very happy client the day before the opening ceremony. Symbiosis at-show support team was already on-site to help with the finishing touches from stocking the fridges & placing the floral displays to uploading co-exhibitors video presentations. To get the show off to a flying start we were back early the next morning to meet the welcome hosts, brief our on-stand cleaner as well as help late arrivals. Our support continued throughout. Nothing was too much trouble from installing a PA & manning the mixing desk for a Bahraini traditional folk band or even providing crowd control for the visit of celebrity chef John Torode. All part of the Symbiosis #OutStanding service. Did you find the ideas in the ‘Bahrain Tourism & Exhibition Association at WTM 2018‘ case study interesting?